The most isolated, lonely location you can possibly conjure up. Hide 77 comments... Click to show. :| The contest price rose? i think that site is fake! you got xfire or smthng, or your mail via which I can cntct you? you could do a raffle, or may be I could help you! A raffle would sound good. Where should I set it up? I'll post one for you on Guardian Promotion, just tell me the details, like mail me? Anyone want me to do a giveaway? welcome back mate, dont forget to check our all new forums! Ooh.. I have those next week. Studying so much. .. I'm guessing he just quit FanUp. He was killed by a walking mutated dancing hippo. Hey mate, I fixed the problem! feel free to get your account now! I emailed that email 19 hours ago. So I emailed you guys already. should i ALSO email the admin? To finish that: What's going on? I aim to help, not to win..
lolol. That's one of the largest guides I've seen..
Runescape 3 public beta is coming out tomorrow! W00T!! Are you going to start playing again??? Good Luck on the Weekly! I wish you good luck on weekly bro. Hey Jon,you gonna participate this week? 1 month anniversary! TIME TO PARTY! WOOHOOO! Congrats on getting the Master Guide Smith badge. With this badge, you'll be able to make tons of longer and more detailed/colorful guides! Hope to see some great ones soon! Congrats on the New MSG badge :), We both got it!! YEAH BUDDY! Thanks, but I'm not competing this week. No you can't change your name, although you can try requesting the community manager! Hi! I just bought a Karma coin card but the code isn't working!!!! Gratz... I wish I won. Well what do you want to buy? Hey where do I go to post for suggestions for FanUp? Hey Jon we really had a nice conversation. I gotta take my rest now, I'm happy that my wish just came true. <3 Good luck to us! Hapi bday man. Have a nice one! Yup! Did you get anything for your birthday? Oh. Well, that's always nice. You can buy whatever you want lol. u liek me? no? scre ya!! ??? Do I know you??? Meh, I'm taking a week off. ooh! OK, I will have more possibilities xD! Congrats on coming in third place Jon! Nice to see you have some good guides in there! History of FanUp, How it was made, If you have anything else please tell me. Don't owrry if balboa is cheating. He can't win always on the weekly if he's spamming because he has 0 guides. To win the weekly contest it requires 60% of your FC to come from guides. This. Sorry for the late reply. I was sick all week. hi and welcome to fanup, good luck on the week!! -.- I bit late to say that. I can't make an avatar. It's a bug, it works for some, doesn't for others (like me). You can upload your own Avatar or try another browser/comp and see if that works, while it's being looked at. How long before it is fixed? When you have the time please contact me when it is fixed. It says that the page is not found. 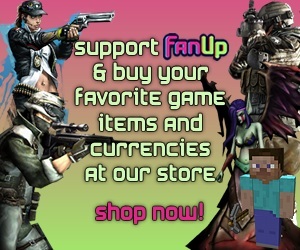 Welcome to FanUp! :D Please be a responsible user. Thanks :). Also, if you are looking to win the weekly leader board contest, please keep in mind that spamming won't help since 60% of FanCoins earned must be from submission of Guides, Tips/Cheats, Articles etc. Enjoy your time here at FanUp :D.